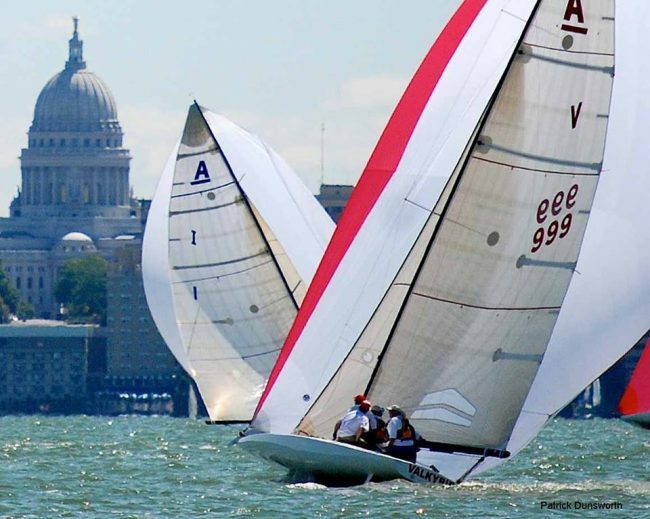 The 2019 NCASA National Championship will be hosted by the University of Wisconsin Hoofer Sailing Club in conjunction with the Madison Youth Sailing Foundation (Patrick Heaney, its president, is one of the Co-Chairs) and the Mendota Yacht Club. The event is always held the weekend after Fathers’ Day, with Thursday June 20 for set-up and check in, and racing Friday through Sunday June 23. We are excited to help the UW Hoofer Sailing Club christen their brand new facilities at the UW Union. This project has been under way since we were last there and from what we hear it is spectacular! This is very possibly our fleets’ finest sailing venue with all of its offerings—sailing area, event social activities, extra-curricular activity potential, and all Madison has to offer. This is a not to miss event! Regatta Headquarters will be in the glass room called Mendota Lodge which is located on the lower level of Memorial Union, directly on Mendota’s shoreline, just west of the terrace. This room will be used mostly for any protests that need to be heard and for the RC and anyone else who needs shelter in case of bad weather or other delays. We are fortunate to have access to the newly renovated Union and the terrace while we are there. There will be parking available near by and will be announced as we get closer to the event. Our Friday cocktail party will be held immediately post-racing (come in your gear direct from the water- do not pass go!) and our Saturday night dinner will take place at the Memorial Union Main Lounge, 2nd Floor, Memorial Union, 800 Langdon Street, Madison, WI 53706. This is a beautiful space graced with spectacular views of the lake with veranda and staircase to the Terrace and the lake. Launching, trailer storage, access to mooring field, and limited dry-sailing will be at UW Lot 60 shown on the map at the bottom of the NOR. We will also have the haul-out, trophies and lunch on Sunday at this site. Our PRO will be Mark DeGuire along with his team. Special thanks to Patrick Heaney and Donnie Anderson for arranging for and providing RC boats. If you have not made your hotel reservations—please do so soon as they are all filling up! The blocks name is National Class A Scow Association at all of the hotel listed on the NOR and below as well. Also note—all of these room blocks are set to return any unused rooms to inventory 30 days prior to the event unless otherwise noted. This regatta is open to A Scows that comply with NCASA specifications. You have until May 20, 2019 to register, after which there is an additional late fee of $100.